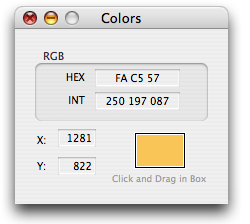 This OS X executable is a simple tool for showing the RGB values of any pixel visible under the cursor. Enjoy. I made it as my first app to refresh myself with the OS X platform after being away from NextSTEP for 7 years.